Here we have the last of the Creative Remix feature – the art display at the Exhibition Hall at the Roundhouse. Below is the original display concept that I proposed to Roundhouse with my own sample projects. Below are the individual art displays arranged by the kids themselves, literally minutes before their special guests arrived at the exhibition hall. Here are a couple of photos taken at the event. Special thanks to DB Boyko, Arts Programmer at Roundhouse and to Sonia Nikitin, my assistant during the whole run of Creative Remix. Most of all, my deep gratitude to our young workshop participants who gave their best in this wonderful creative journey. We come to the 5th art-ivity in my Creative Remix workshop at Roundhouse Centre…Outdoor Mandala. Originally, we were going to try making one at the park or near a beach but in the end we just did one right outside the Roundhouse. Determine the size of mandala you are making. It is best you mark the pavement with a chalk to guide the kids. Group kids and assign component to add onto mandala. Designate which part of circle they are filling. 4. Take group photo and enjoy the group’s outdoor masterpiece. 5. Then of course, everybody helps in tidying up after. Bear in mind again, these are kids ages 5 to 10 working on an outdoor mandala for the first time. I think they did an amazing job. Bravo, kids! Hello friends of the MoNA and lovers of naïve art! I bring to you a series of kids art that were created at the CREATIVE REMIX summer workshop that I facilitated at the Roundhouse Arts and Recreation Centre in Vancouver. The kids were ages 5 to 10. Two or more animals that would not normally meet, are stranded on a tropical beach…what will they talk about? Present dialogue to class and animate your magnetic puppets on the mini stage provided. A bear and an octopus ..hmmm u have to wonder what they might talk about? The kids each held a magnet to control their paper puppets. How about an elephant, a pelican and a moose? What could they possibly talk about? Here’s a giraffe and a turtle, crossing paths on a sandy beach. Magnets are tricky to use. However with some practice, the children enjoyed controlling the animal-puppets behind the backdrop and performing before the class. Salamat/ Thank you for making MoNA a part of your Gabii sa Kabilin/Heritage Night Adventure. For GSK 2018, the MoNa highlights the collection called Fish-to-Face. The balangays traveled on our pre-colonial seas and under the surface was a rich and diverse marine life. These were the same species of fish and corals that artist Paulina Constancia encountered on her diving trips in Bohol and Cebu in the 90’s. Once again, our deep gratitude for joining us at GSK. See you again next year! But remember, the MoNA is open throughout the year from MONDAY TO SATURDAY – 10AM TO 4 PM (CLOSED SUNDAYS & PUBLIC HOLIDAYS). So come see us again with your family and friends. You don’t have to wait till the next GSK. Ali namo pag-usab sa MoNA! Note: The FISH monoprints featured on this post were created by GSK goers at the Monoprinting Workshop at the MoNA on Heritage Night/Gabii sa Kabilin. Here is a Christmas project that I did with my son’s class. It all started in our kitchen with homemade clay using a recipe I found on Tips from a Typical Mom. Here are some photos from our kitchen while my 7 year old son and I prepared the homemade clay. Allow to cool and let the Christmas painting fun begin!!! They now hang on the cardboard tree I made for their class. Wanna make this tree? It’s easy. Just cut cardboard, paint and put a strip of of wood in the back of the tree for support. I drilled a hole on top of that wood strip so I could put string through for hanging. To hang the ornaments, use a roundhead paper fastener. Spread the Christmas spirit — make your personalized clay ornaments in your home, classroom, or workplace… if my little boy and his classmates could do this project so can you. On Saturday, May 27th, the day after Gabii sa Kabilin, MoNA’s visiting Indian artist conducted a special rangoli workshop for a group of young participants from My Refuge House. Show and Tell. The girls said that when they saw the display from the workshop yesterday they wondered if they could possibly make something so beautiful. And they did! Their works were just beautiful! Love and gratitude to MoNA’s visiting artist YASHA DABAS for sharing her time and talents with the girls. ..the time together was memorable and the work- -simply amazing! We continue with the feature on the rangoli-making process, photos taken during the pre-heritage night community workshop facilitated by MoNA’s visiting artist Yasha Dabas. Yasha and Paulina with workshop participants from UP Cebu Psychology Program. Far right -another participant- Aggie Tomayao. It was a lovely afternoon making friends and trying out a new art form. Thanks again Miss Yasha Dabas for sharing your time and talent with us. We are eternally grateful! Here are photos showing the process of creating rangoli art during the community workshop facilitated by MoNA’s visiting Indian artist Yasha Dabas. We come to last feature of the Waves of Hope/Mga Balud sa Paglaum expressive arts workshop recently facilitated by Paulina Constancia on the beach in Moalboal for the Cebu Technological University World Literature students of Miss Robbie. Hope, hope onto the world. Day 6 (June 16) – The artists created a little bit in their studios in the morning then in the afternoon off they went to the capital city of Ljubljana. Our group entering the National Gallery from a back entrance. That’s IVANA from Serbia, a fellow participant in the meeting in Trebnje. Slovenian sculptor Rok Mohar, one of the participating artists in the 49th International Meeting of Naïve Artists at the Trebnje Gallery, is a resident artist of the Metelkova. He takes his artist-friends on a tour of the colony as well as his home studio. Days 3 to 7 (June 13 to June 17): The participating artists at the 49th International Meeting of Naïve Artists at Trebnje Gallery interacted with various groups of schoolchildren. Paulina Constancia thought of a little collaborative artwork she could start with the young visitors. Paulina showed the children the possibilities of trace-cut-glue. So the piece “Show Your True Colors” was born! Here’s Paulina unifying the many elements contributed to the piece. Here’s the completed želva/turtle collaborative art made in Trebnje entitled “Show Your True Colors”. (created by Paulina Constancia in collaboration with young visitors at the International Meeting of Naive Artists in Trebnje Gallery, Slovenia- June 11-18, 2016). Using fabric and acrylic paint, many contributed to this piece. Translations of “Show Your True Colors” in many languages was made possible with the help of the other participating artists at the meeting. 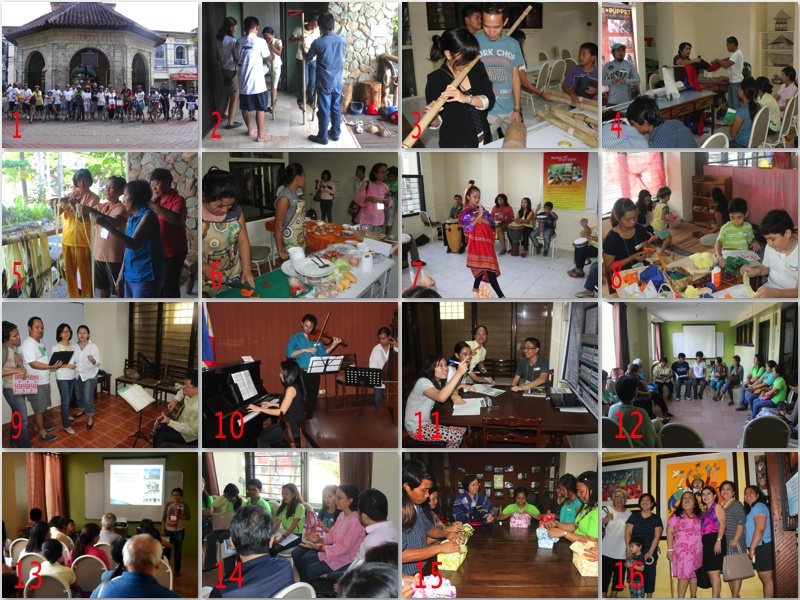 Sugbuanong Awit and More with Sistemang Pilipino, Inc.
Sugbuanong Awit and more led by Sistemang Pilipino,Inc.